If you are new to earning money from your blog and aren’t sure where to start or how it works, then for your first network I recommend starting out with something nice and easy to work with and one especially designed for bloggers. The first agency I’ve chosen is Escalate Network, and in the video below I explain why I think this is a good place to start and why it has something suitable for all websites and bloggers. It also has a variety of offers including Pay per Click, Pay per Conversion, and Pay per Sale (all explained in the video). Take a look at the easy sign up process and how to set up and place your first advert. Note – click the little box bottom right on the video to bring it up full screen, and use the ‘gear’ icon to change the resolution to make the video more clear. What is the minimum payout and how quickly will I be paid? We pay our affiliates when they reach $25. Escalate pay NET 15. This means within 15 days after the end of every month, we pay every affiliate who has earned more than $25 since their last payment. So on 15th August you will receive your earnings from July. We offer payment via Check or PayPal. Do I have to put banners all over my site to earn money? No, you don’t have to put banners all over your site, in fact, our offers work much better as individual blog posts. All of our offers can be posted as blog posts. Some require a banner to be included with the blog post, but we prefer to work with advertisers who understand you have a unique voice so you can customize your blog post with your own images, text, and personal style. How do I earn money from Escalate Network? We are a performance based affiliate network. Most of the advertisers/offers we have in our network pay a certain amount each time some sort of action occurs. This means you typically earn money when someone prints a coupon, signs up for a service/newsletter, fills out a survey, purchases a product, or performs some other sort of action. We call these “conversions”. There are some offers in our network that pay per click, but most pay per conversion. What sorts of offers/advertisers does the Escalate Network have? We focus primarily on deal and coupon related offers. This includes coupons, freebies, samples, daily deal sites, as well as popular cash back and reward programs. Instead of hundreds of offers, we focus on around 50 top performing offers from legitimate companies. We avoid spammy/scammy offers and shady redirects that will confuse and frustrate your visitors. Tracking your success with Escalate. Now that you have chosen and placed your first adverts, you need to track which of them are successful and earn you money – and which are a waste of your precious space. Some of this will be related to their placement on your site – higher up adverts will typically get more views than adverts towards the bottom of your pages. But the degree of reader interaction and the payout for it will also affect your earnings. So let’s take a look at how we can track impressions, clicks and income from our adverts with Escalate. Another great money-earning feature of Escalate Network is the ability to offer printable coupons to your readers – and get paid when they print them! These can be incorporated into your posts as part of your content, or as a widget in your sidebars. Earn 42c if someone prints the coupon! Great for recipe posts, or any time you can incorporate a product into your writing. For example – feature a recipe for cupcakes and give your readers a coupon for a $1 off frosting. Did you know that in a recent survey – 62% of households said they had used a coupon to save money in the last month! 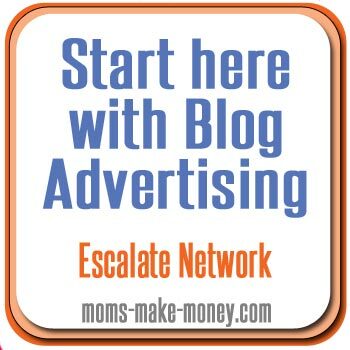 I highly recommend Escalate as a nice and easy place to start with blog advertising. It was my first network, and the customer service is excellent so if you run into any difficulties your personal account manager will help you out. They do however usually require that your blog is 6 months old before they will accept you, unless you have already got a very active blog with a lot of posts and activity. If this isn’t yet you – put a note in your diary and apply to Escalate in the future. They have great service, great payment terms and a lot of relevant offers for Mom bloggers. Thanks for such a thorough post about Escalate. We’ve been thinking about adding some advertisers, but want to make sure we make the right choice for our blog. I’m visiting from the Peek Into My Paradise link party. Great info! I’ll have to look into it some more! Still trying to find good ways to make some money with my blog. More awesome information, thank you so much! 🙂 It gets very confusing trying to sort out all of the different options. You really do help simplify it! Thanks for the info! I signed up with escalate but have been a little confused on how it works. Excellent information. I’ve been thinking about ads for a while because right now I can’t apply for AdSense, so this could be a good option!!! Thanks for sharing this with me at Bewitch Me & Titi! Hope you are having a great weekend!!! Thanks for sharing this – you always have good blogging info and tips! Great information. I hadn’t heard of Escalate before, it’s now on my list of sites to look into. I know you like Escalate. But, they seem to lack the type of advertising I would choose for my blog. However, it may work well for others who are into couponing and such. Have you done well promoting them on your blogs? I’m guessing the referral fee is what is paying off for you. Yes? Also…I got dissed by AdSense too. The only thing I can figure out is that I added a check box to prove “you’re” not a spambot and that made someone mad. I also have Akismet which collected hundreds each day…but I was tired of having to scan that for those it mistakenly added to the spam mix. I’ll be waiting now for AdSense to respond to my reply. Fingers are crossed. Hi Diane, Actually although I love Escalate personally and recommend it to others, I don’t earn much by way of referral income. Last month, July was a grand total of $1.39 for the whole month from my referrals. And of course it’s true that not all of their offers will be suitable for everyone. I always did really well promoting giveaways in the early months of this year, but now I don’t do that so much or have the time! I did well on the ones where you earned per click – lots of 7c at a time can add up to a couple of hundred dollars in the end. And I did well promoting some of the fashion offers and the things like free nursing covers. Sorry to hear about the Adsense – I doubt it was anything to do with the spambot thing. But hundreds of spam comments a day – that’s crazy. I’ve only had about 300 in 10 months. I wonder why you are getting so many – are your comments “dofollow” ? Hi Deby, came to your blog from pinterest and i just love the way you are making money on your blogs, that’s really great and i have lots to learn from you. I have skincare and makeup blog “beautycareforwomen.blogspot.in” I wanted to know if esclate would be good for me if i join? There is no harm in trying it out. The offers are primarily aimed at women and that is certainly the target audience on your own site, although you will find that you’ll ideally need readers from the US on your site in order to do best with them, like most offers and advertising. Some offers will be online and suitable for whatever demongraphic and geographic you have. Certainly apply to sign up and see if you get accepted. Keep persevering if they turn you down the first time, and keep checking back because they get new offers all the time, some of which will be more in your niche than others. Good luck with it. Nice information. I do have a website namely http://www.vskart.in and here I offer coupons Wish if you could visit and suggest your views.